A book to celebrate the twentieth anniversary of Good Dog, Carl. A book to celebrate the twentieth anniversary of Good Dog, Carl. Once again, Alexandra Day has concocted a very busy day for the amazing and all-around resourceful Rottweiler Carl. His owner believes Carl is at home taking a nap, when really he's making tracks all over town. He visits a bakery, makes a delivery for the pharmacist, helps out a veterinarian, and joins in a magician's act in the park. But in the most important event of the day, Carl becomes a real hero when he rescues a litter of puppies from a fire. With eight more pages of fun than in the previous Carl books, this captivating adventure, related mostly through pictures, will delight fans old and new. 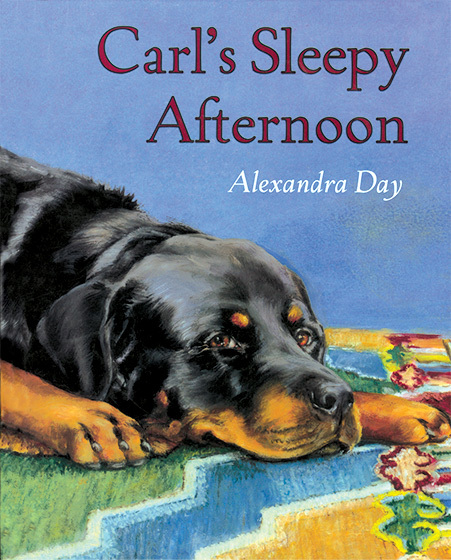 THIS BOOK IS SIGNED BY ALEXANDRA DAY & WITH A STAMP-PRINT OF THE REAL CARL'S PAW.